This may be the best thing I’ve seen all year, no lie. Crouching Tiger, hidden Verlander? 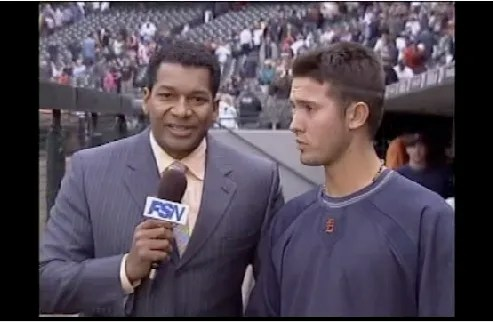 So Porcello’s just minding his business, talking to Trevor Thompson about his second start and his first career victory. He has this cool, calm, collected air. He’s like the James Dean of the Tigers’ pitching staff! Get this kid a leather jacket, stat! o hai, background Verlander! Porcello is none the wiser. Verlander is relentless. He really rubs it in there too. Porcello can’t escape. Still rubbing it in there. 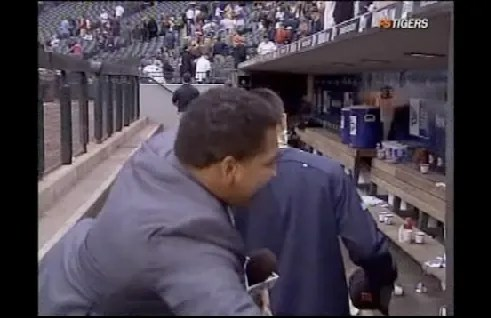 Verlander wants to make sure it gets into every nook and cranny. 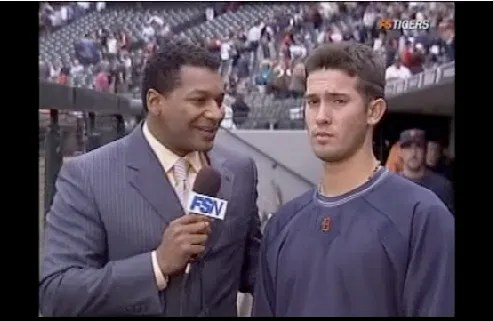 OF PORCELLO’S FACE, YOU PERVERTS. Maybe a little overkill, Justin. Maybe. Look at the placement of his hand! Porcello has nowhere to turn! Now that’s cold. 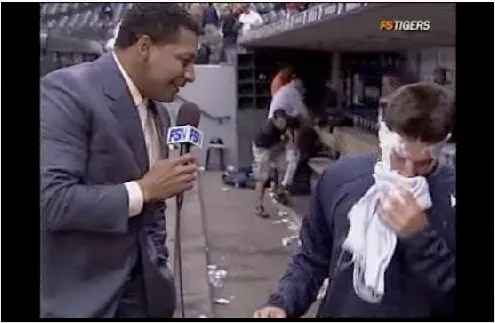 Porcello tries to shake the shaving cream off his face like a dog. That doesn’t work so well. Porcello or Frosty the Snowman? You be the judge. 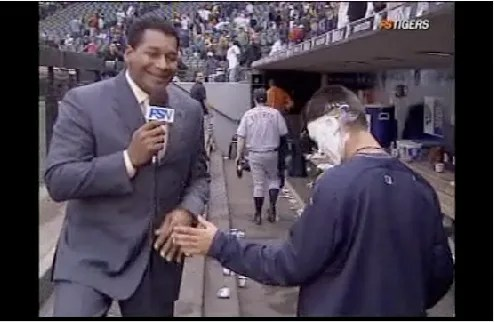 Porcello stumbles around blindly for a few seconds while several people laugh at his expense, including Trevor Thompson. 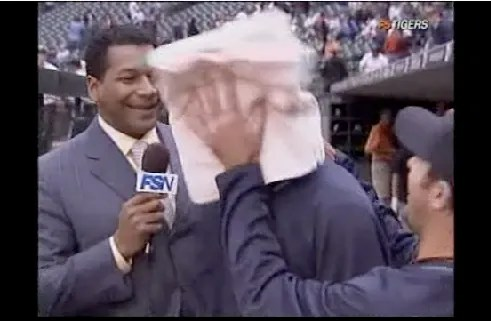 At this point, Porcello is saying “I can’t see!” in a very high pitched voice and the interviewer is just laughing at him. In the background, you can hear Verlander cackling as he slinks away to the clubhouse. 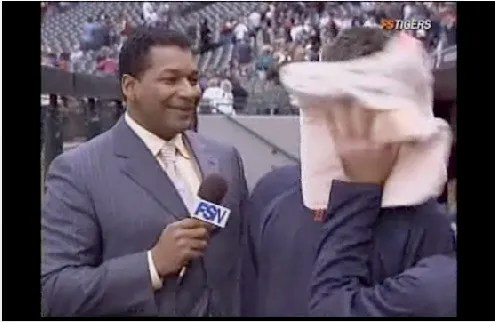 Then Thompson remembers that, hey, we kinda need this kid. 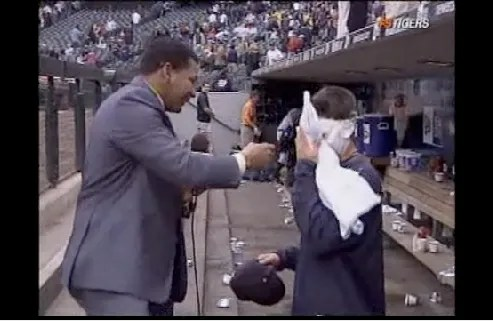 It might be a good idea not to let him go wandering in the dugout blinded, and Thompson grabs a towel for him. 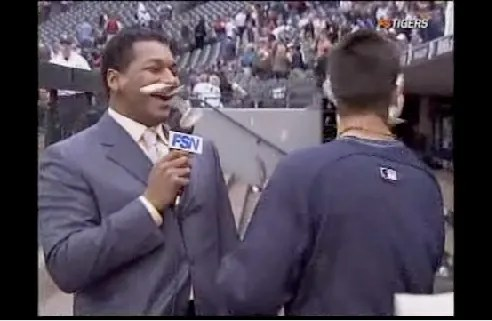 Porcello must then lovingly clean shaving cream off his hat before he can continue the interview. Now that’s dedication. 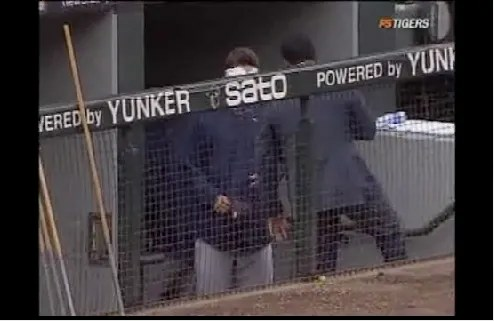 No one in the dugout bats an eye, either. Which was the second best part about the whole thing. He kinda has a Tom Glavine thing going on right here, don’t you think? 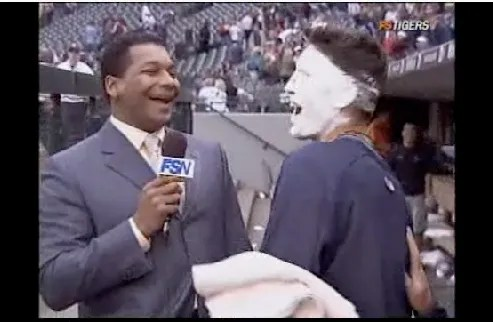 GRATUITOUS CLOSEUP of Porcello’s shaving creamed face. GRATUITOUS CLOSEUP of Porcello laughing. Taking time to reflect on that day’s victory. OMG, how much do I love this kid? 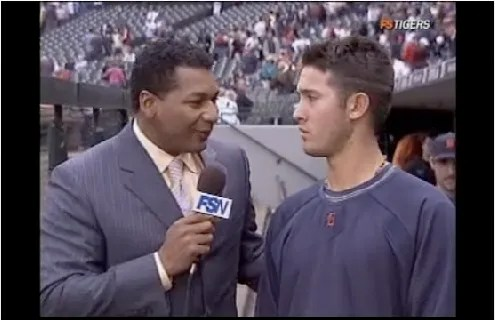 Thompson asks him how it feels (winning his first start) and he says: “It felt good to come out and get the two wins.” HOW ARE YOU SO COMPOSED, RICK PORCELLO????? ARE YOU FOR REAL OR JUST A VERY COOL, CALM, COLLECTED AND COMPOSED FIGMENT OF MY IMAGINATION????? 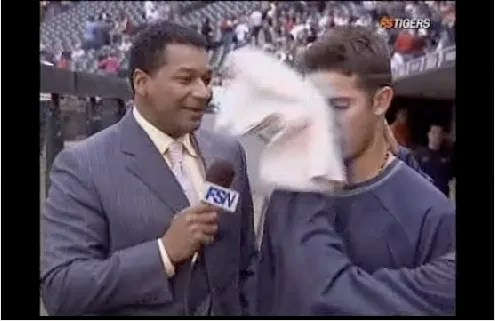 Porcello says that he “really can’t see,” and yet manages to continue the interview whilst blinded. Uhh he laughed at something here but I don’t remember what it was and I don’t care. Then they talked about the bank bailouts and Porcello said he thought that the bonuses the CEOs received were– no, I lie. I don’t remember what they were talking about. He’s such a baby! And yet. Thompson tells him to enjoy the win. Trevor, he’s a 20 year old guy. He’ll find a way. ← Murphy’s Law Hates the Tigers.